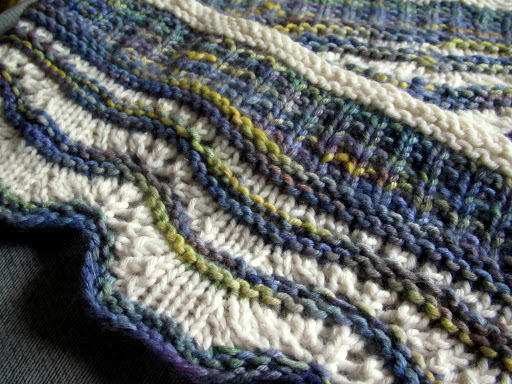 Drumroll please… here’s my new design for the Malabrigo Quickie series: Dissipative! 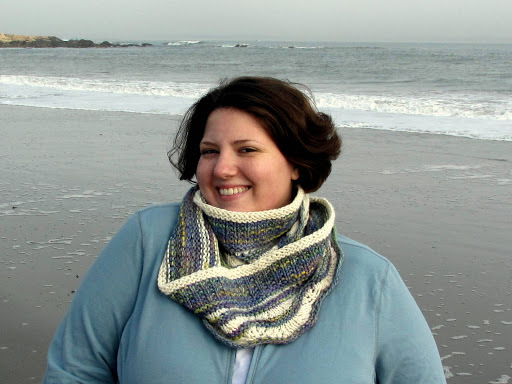 The large size is a long cowl that can be wrapped twice around the neck or worn scarf-like. It uses less than 2 skeins of Malabrigo Twist and is designed to play nicely with variegated colorways. Dissipative beaches are composed of fine sand with gentle slopes that cause high energy waves to break in a spilling, washing motion over the wide beach face. 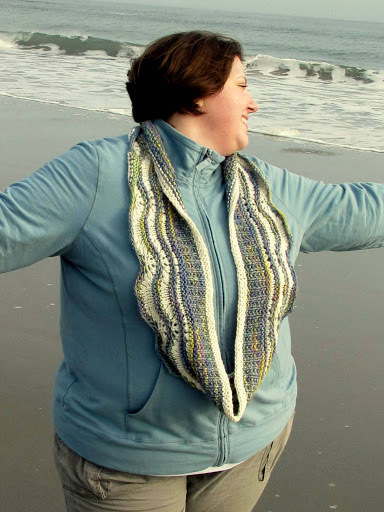 I tried to mimic this idea in this cowl, which begins with long, undulating waves of a contrast colorway that wash their way up onto the textured shoreline of the variegated main yarn. And get this: the reverse side of the textured section is even called ‘sand stitch’, is that perfect or what? 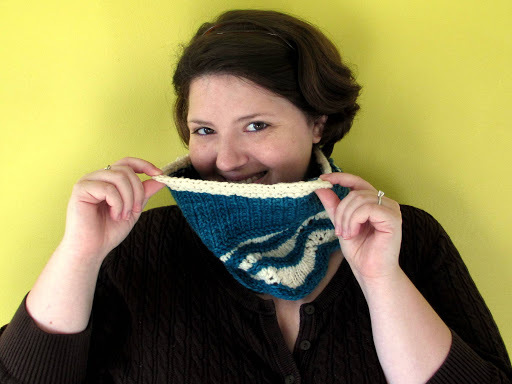 The pattern includes a small size for a more standard cowl as well as a little trick for knitting garter stitch in the round without purling, in case you’re anything like me and love garter stitch but hate purling. It can be purchased for $5.00 through paypal by clicking the button below, or it can be found on Ravelry, Craftsy, and (soon) Patternfish. BONUS! Since it’s my birthday this week, I’m running a promotion on Ravelry for 28% off (not like that’s my age or anything…) the price of any and all of my patterns when you enter the coupon code ‘bdayweek’ at checkout. The coupon is good through Monday 1/28/2013. I hope you enjoy! This entry was posted in Malabrigo, MyDesigns, release by shoelaceswitcher. Bookmark the permalink. Congratulations on your gorgeous new pattern!!! And happy Birthday! I love your new pattern, it is so pretty! And I hope you have a great birthday week!! Congrats on your new pattern: it's beautiful! 🙂 And happy, happy birthday!